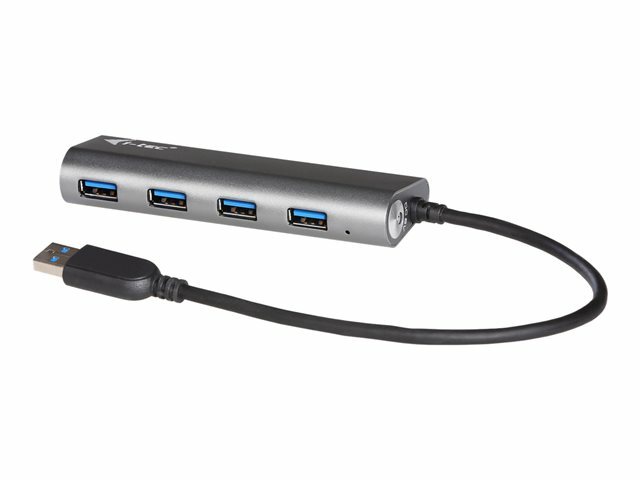 i-tec USB 3.0 Metal Charging HUB is an ideal companion for everybody who does not have enough USB ports in his/her notebook, ultrabook or PC and who has to constantly connect and disconnect his/her favorite USB equipment such as flash disks, mobile phones, tablets, digital cameras, MP3 players, printers, etc. This HUB offers 4 USB 3.0 ports with the Plug & Play function and standard USB charging - the HUB will automatically detect connected equipment for USB charging. The USB 3.0 interface is important mainly for data transfers from USB 3.0 memory cards and flash disks which will use its high transfer speed most. The advantage is included external power adapter which you can use for backing up data on external hard drives or for connecting high power consumption devices which are powered directly from the USB port. This HUB does not require installation of drivers. You will just connect it by the USB cable to your computer and immediately you can start using it. This HUB has a built in overcurrent protection of your computer in case of short connection on the peripheries. The interface is compatible with USB 2.0/1.1. Thanks to its compact dimensions and low weight it is an ideal companion to your notebook when traveling.